Balderson, R-Zanesville, won the Republican nomination in the May 8 primary. He now faces Democratic nominee Danny O’Connor, Columbus, in a special election Aug. 7 to finish out the remainder of Rep. Pat Tiberi’s, Genoa Township, term. Tiberi resigned from Congress earlier this year to take a position as the new head of the Ohio Business Roundtable. 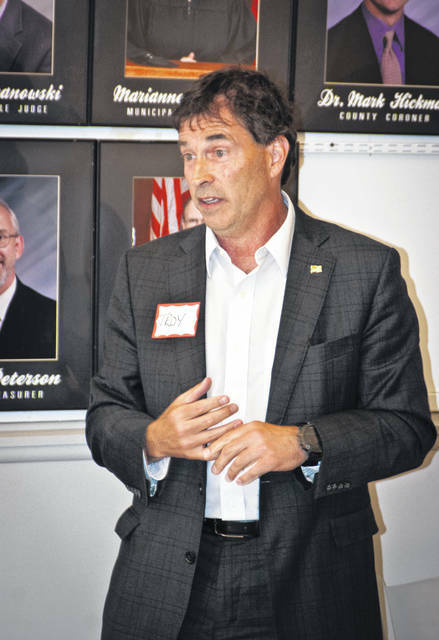 Balderson told the group it was obvious he wasn’t well-known in Delaware County, but he was looking forward to changing that because if he was going to be their U.S. congressional representative. To do that, he plans to spend more time in Delaware County than any other place. Balderson said he had seen the Monmouth University Poll showing that he has a 10-point lead over O’Conner. Balderson also told the group that polls scare him because after the poll was released, both O’Conner and the National Democratic Party became “very motivated” and started making large media buys against him. Balderson said the realization is that the August special election is being held during a time when families are taking vacations, families are getting kids ready to go back to school, and the fair season is in full swing. “With all of that going on, it’s really going to be a tough time,” he said. Balderson said someone told him if he doesn’t win in August, he still can run in November. He said if he doesn’t win in August, it will put a “whole lot of blood in the water” for the Democrats, and they will not lose in November if they win August. This entry was tagged D. Anthony Botkin, Danny O’Connor, delaware county, Delaware County Republican Women’s Club, GOP, Ohio 12th Congressional Seat, Troy Balderson. Bookmark the permalink.